My original intention had been to attend World of Coffee for all three days (it runs from Thursday to Saturday). However, a rather late calendar clash meant that I had to go to Durham on the Thursday, resulting in the Friday being spent travelling to Amsterdam, leaving only the Saturday free for me to attend. I did look into flying on the Friday, but it was prohibitively expensive and wouldn’t have got me there until mid-afternoon, so I decided to take the train instead, which led to a rather absurd route of Guildford-London-Newcastle-Durham-Newcastle-London-Amsterdam, the travelling spread over three days. World of Coffee was held in the RAI, a sprawling exhibition complex south of the centre of Amsterdam, but easily accessible by public transport. Since I was only there for one day, I ditched any plans I might have had for exploring the whole exhibition, catching any of the World Barista Championships or trying to attend some of the talks and cuppings. Instead I focused my attention on the Roasters Village and catching up with as many European roasters as I could (the UK roasters were conspicuous by their absence). However, before we get onto that, here’s a quick rundown on what else was going on. In my life before the Coffee Spot, I attended a fair few trade shows and, in many ways, the Roasters Village and World Barista Championships notwithstanding, World of Coffee feels much more like a trade show than it does a coffee festival. Getting in was a straightforward process with none of the queues I find at other festivals. It’s also really well catered, with a large, outdoor street-food area, a similar-sized indoor food village (complete with display of vintage espresso machines) and a couple of cafes serving a range of food inside the main exhibition hall itself. I made full use of the catering facilities, helping myself to a vegetarian wrap for breakfast from the street food guys on the way in and taking a break for a pizza at (a rather late) lunchtime. Although a lot of the big names that you see at London Coffee Festival are also at World of Coffee, the relaxed atmosphere means that you are more likely to be able to talk to people on the stands, resulting in some meaningful conversation. If you are serious about investing in some new equipment for your coffee shops, be it an espresso machine, a brewer or a coffee roaster (the roaster manufacturers in particular always seem to be out in force) then World of Coffee is probably the place to come. There’s a more European feel to it as wellt, so you’ll find names you might not see in London. Whether it was because it was in Amsterdam, I’m not sure, but I also saw quite a few Dutch companies that I don’t see exhibiting in the UK, including Moccamaster and my favourite espresso machine manufacturer, Kees van der Westen, for whom I made an exception to my rule only to spend time in the Roasters Village. Ever since I saw my first Kees van der Westen espresso machine, I’ve been in love with them, finding them visually stunning. I’ve also been known to give them an occasional stroke or two in coffee shops when no-one is looking. A Dutch company, it was no great surprise to find Kees van der Westen exhibiting at the World of Coffee in Amsterdam, so I wasn’t about to miss the chance to get up close and personal. Kees van der Westen has a pretty simple range. There’s the Mirage, with its E61 group heads and unmissable curve-wedge shape. Then there’s the top-of-the-range Spirit, which I’ve described before now as the Formula One car of espresso machines (in terms of its low-slung looks). And finally, there’s the Speedster, a single-group machine with the looks of Mirage, but the innards of a Spirit. However, at World of Coffee, Kees van der Westen was launching not one, not even two, but three new designs. We’ll start with the one that’s out in the wild, so to speak, which is the Idro-Matric pre-infusion device. I actually first saw this earlier in the day when I visited the Bailies stand in the Roasters Village, but I got the full rundown at the Kees van der Westen stand. It’s a pre-infusion device which is available on new Spirit and Speedster models and which can be retrofitted to most existing machines in those ranges. It consists of a transparent cylinder which sits on the top of the group head and contains a manually-adjustable spring which controls the pre-infusion pressure. This allows the pressure a slower ramp-up over time than the standard group head. At first, I was puzzled by this, since I’m used to lever-espresso machines where the pressure reduces as the spring decompresses, but this, counter-intuitively, increased the pressure. How did that work? However, a quick explanation cleared it all up. The Idro-Matric works in the opposite way to a lever machine. As the water from the pump floods into the group head, it forces the piston up. The tighter the spring, the more pressure it takes to force it upwards, so the lower the build-up of pressure going through the ground coffee. So, if you want a lower, slower build-up of pressure, just tighten the spring. If you want the pressure to rise faster, slacken the spring. The transparent cylinder lets you see the spring compressing during pre-infusion. Genius. The second launch is of a new member of the range, the Slim Jim, which will be available in early 2019. This sits between the Mirage and the Spirit, incorporating some of the Spirit’s high-end capabilities, such as a single boiler per group head, into a new body, again somewhere between the low, sleek lines of the Spirit and the chunkier shape of the Mirage. Like all the Kees van der Westen machines, the Slim Jim is customisable, with a choice of finishes, side panels and feet. I was particularly taken with the caterpillar feet which made it look like a tank! Sadly the demo models on the stand weren’t plumbed in, but I look forward to seeing these in coffee shops next year. Perhaps the most exciting development is a new lever version of the Slim Jim. Kees van der Westen used to make lever machines, but stopped production a few years ago. However, with new lever machines coming out, Kees decided to come back with a new design. Again, I only saw a non-working prototype, but it looked gorgeous, with the same transparent cylinder as the Idro-Matric, so you can see the spring compress/decompress. Perhaps the best feature is that once you have pulled down the lever and compressed the spring, you can lock it into place, so you can let go of the lever without fear of it springing back up and hitting you in the chin! Like the Slim Jim, I look forward to seeing these beauties in coffee shops next year. 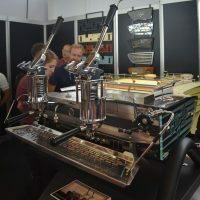 You can also see what Sprudge made of the Kees van der Westen stand, which was top of its list of five favourite stands at the World of Coffee. After that brief diversion, it’s onto the Roasters Village. You can see what I found after the gallery. The Roasters Village is home to numerous small (and not so small) European roasters. Unlike the World of Coffee 2016, which was held in Dublin, Amsterdam attracted very few UK roasters. In fact, the only one I saw was my first stop, Bailies Coffee Roasters, who had come over from Belfast. I first came across Bailies in Dublin where it had a separate stand for pour-over and another for espresso, an excellent idea which was replicated here. Bailies also had a decaf stand in Dublin, and, impressively remembering that I like decaf, I was given a bag to take away, along with a few other samples. While Bailies main market is still Belfast/Northern Ireland, it has wholesale customers throughout Ireland and increasingly in mainland Europe, while also making inroads into the British market. I did see Bailies at this year’s London Coffee Festival, but the stand was so busy I never got near it. Today I made a bee-line for Bailies, my Kaffeeform cup and I enjoying the Ethiopian Guji espresso, a gorgeous naturally-processed coffee with a fruity taste, but at the same time having an incredibly smooth mouthfeel. Next stop saw me staying in Ireland (sort of) as I caught up with Cloud Picker, another roaster who I’d first met at World of Coffee 2016 in its hometown of Dublin. The most unusual coffee on the stand was a washed coffee from the Democratic Republic of Congo, a coffee-growing region with immense potential, but wracked by violence (as an illustration, the part of the Congo where a British couple were recently kidnapped is one of the main coffee-growing regions and the local farmers have to put up with these armed groups on a daily basis, but, of course, this said of the story never makes the news). Back to the coffee, which made for a very refreshing, clean pour-over. Hopefully we’ll see more DRC coffee in the future. After that, I wandered around until I found myself in Berlin (sort of) at The Barn. I’ve enjoyed The Barn’s coffee all around the UK, but this was the first time I’d actually spoken with them. Given The Barn’s reputation and how, outside of Germany, it is synonymous with speciality coffee in Berlin, I was surprised to learn that it had only being going since 2012. The Barn’s focus on flavour is winning it friends all over the world, and there’s a particularly strong following in eastern Asia. I tried a couple of the single-origins which were being brewed up on the Chemex. Both washed coffees, there was a clean, sweet Colombian from La Dominguez and a contrasting, rich, aromatic, fruity Kii AA from Kenya, one of my standout coffees of the day. Up until now, I’d known/known of everyone I’d visited. For my final stop before lunch, I called in on Stow Coffee Roasters, a completely new name to me, from Ljubljana in Slovenia. Established in 2013, Stow is slowly weaning Slovenia (and its neighbours in central Europe) off its predilection to dark roast Italian coffee. To be honest, based on the coffee available on the stand, the people of Slovenia are being spoiled rotten. I had a couple of pour-over samples. The first was a Panama Geisha that was used in this year’s World Barista Championships. In a variation on the natural processing method, the coffee is fermented in glass boxes to improve the consistency of the processing. It’s a lovely coffee, sweet and complex, but, to be honest, it wasn’t my favourite. This was a natural Ethiopian heirloom coffee from Gelana Abaya. It was absolutely gorgeous, with a strawberry sweetness to it that I’ve never tasted in a coffee before. Outstanding and easily my coffee of the day! You can see what I got up to after lunch after the gallery. I must confess that I slowed down a bit after lunch. I decided to say hello to some of the local roasters, calling in on Lot Sixty One for a quick chat, but knowing that I would be visiting Lot Sixty One’s coffee shop later on during the trip, I didn’t try any of the coffee. Instead, I wandered over to 19 Grams, one of many Berlin coffee roasters which aren’t called The Barn. 19 Grams has been roasting for five years, but its parent company, Tres Cabezas, goes back a lot longer, set up by two Berliner surfers who went to Costa Rica, discovered the excellent coffee there and decided to bring it back to Berlin. These days, 19 Grams still has strong links to Costa Rica and one of the coffees on the stand was an SL28 (a Kenyan varietal) which is being grown in Costa Rica. This is a naturally-processed coffee, unusual for a country where the coffee is more usually washed. However, the story goes that there was an earthquake just after the coffee harvest, which knocked out the power. Needing to get the coffee processed, the farm sun-dried it instead and, liking the results, have done so ever since. I also had an interesting washed heirloom coffee from Kochere, Ethiopia, as an espresso, continuing a line of excellent Ethiopian coffees I’d had during the day. My final stop in the Roasters Village was at Coffee Pirates, who hail from Vienna. Now I must confess being unaware of speciality coffee in Vienna, but now I know better. Coffee Pirates has been going since 2012 and, like Stow Coffee Roasters, it has been slowly growing a market for speciality coffee in a city famed for its darker roasts. As well as having its roastery and a coffee shop in the city, the Coffee Pirates estimate that there are probably 10 to 15 good coffee shops in Vienna now. Maybe it’s time for a visit! After all that coffee, it was time for some decaf. As well as the bag from Bailies, I was also a regular visitor to the Swiss Water stand, partly to catch up with my friend, Jess (of EatingEast fame), and partly to try some of the many single-origin decafs that they had on offer. It’s been almost three years since I last wrote a significant article on decaf, so perhaps another is overdue. However, for now let me say that there are plenty of excellent decaffeinated coffees out there. I’ll also say that while Swiss Water is the best-known of the decaffeination companies, there are other decaffeination processes too. I actually started my day with a visit to the Swiss Water stand. I also had my new WAKEcup, a metal travel mug with a bamboo outer shell, with me, and together we tried a Colombia pour-over which was excellent. A complex coffee, with plenty of flavour, it’s a good example of how the decaffeination process doesn’t have to result in poor coffee. I also got chatting and was surprised to learn that, by volume, decaf counts for 12% of global coffee consumption, a figure that rises to 15% in the US and 20% in Spain, although it varies markedly around the world. As I can personally attest from my recent travels, eastern Asia, for example, doesn’t have a lot of decaf. Unfortunately, of that global consumption, not much is speciality coffee, although Swiss Water is doing its best to challenge the prejudices and misconceptions about decaf which plague the industry. While on the topic of decaf, I also caught up with Café PIHA, a relatively new roaster from Bordeaux, which was on the Probat stand. Less than a year old and Roasting on a 12kg Probat in the coffee shop, PIHA is slowly converting southwest France to speciality coffee. PIHA was serving a Peruvian single-origin decaf from Swiss Water, which is what drew me there, my only decaf espresso of the day, but a good one, with lots of flavour. However, it wasn’t all about drinking coffee. See what else I got up to at World of Coffee after the gallery. Other than the new Kees van der Westen espresso machines, the most interesting bit of kit I saw at World of Coffee was on the Stow Coffee Roasters stand, where my attention was taken by a pour-over device that looked like a V60, but clearly wasn’t. On closer inspection, it looked like a Silverton Coffee Dripper, but it wasn’t one of those either. It was, in fact, a Gina Coffee Brewer, from Goat Story, the people who brought us the Goat Mug reusable coffee cup. Funded by a Kickstarter which brought in half a million dollars at the end of last year, the Gina is a three-in-one brewing device with a built-in scale connected to an app on your Smartphone. It consists of a stand with a pour-over cone at the top (the V60-like bit), but with a funnel underneath, which has a closable valve (the Silverton-like bit). At the bottom of the stand, where the carafe goes, is the built-in scale. This automatically weighs the amount of coffee or water added and feeds it back to the app, which can guide you through various brewing recipes. With the valve open, the Gina operates in pour-over mode, much as a V60, and the app will guide you through adding the water, telling you when to add it and how much, depending on the recipe. With the valve closed, the Gina operates in immersion mode. When the brewing is done, open the valve, and the brewed coffee filters out. Again, the app will guide you through the steps and timings. Finally, the valve can be set to slowly let the water drip through, turning the Gina into a cold-brew device. I didn’t really get to play with it, but it looked an impressive piece of kit and while a little pricey, if you consider buying all three elements together, plus scales, it’s not bad value for money. Finally, while wandering the Roasters Village, I came across the stand of Wouter Brunia, coffee trainer and consultant. The shelves lined with books caught my eye, including one I’d not seen before, The Coffee Visionary by Jasper Houtman, which tells of the life and legacy of a Dutchman, Alfred Peet. While not a particularly well-known name in Europe, he’s better known in the US as the founder of Peet’s, now a large coffee shop chain (part of the same group that owns Stumptown and Intelligentsia). Back in the late 1960s, the original Peet’s in Stanford was a mecca for coffee lovers, inspiring, amongst others, the founders of Starbucks. I knew of the link to Starbucks through the research I did for my own book, The Philosophy of Coffee, but I had no idea just how influential Alfred Peet had been, nor how much of a pioneer he was. Best of all, Jasper was there, so naturally we got chatting and exchanged books. I’ve just finished reading “The Coffee Visionary” and it’s excellent, telling the story of Peet and how he ended up in America, founding, at the age of 46, a coffee store, where he roasted the coffee in the shop, encouraging his customers to taste and savour the flavours. The book then goes on to map the influence Peet had on coffee culture in America. It’s a fascinating, well-written book, one which I heartily recommend, particularly in an industry (speciality coffee) which is very young and tends to forget (or worse still, dismiss) that which has gone before it. If I’ve whetted your appetite, World of Coffee 2019 will be in Berlin, from 6th to 8th June. Hopefully I will see you there! This entry was posted in Amsterdam, Coffee Kit, Festivals/Awards and tagged Amsterdam2018 by Brian Williams. Bookmark the permalink.